When the SafeDrivePod is installed, it is a great product that protects us almost imperceptibly against our deepest smart phone urges in traffic. However, it is not always as easy to get the system working. This page will support you with the installation. 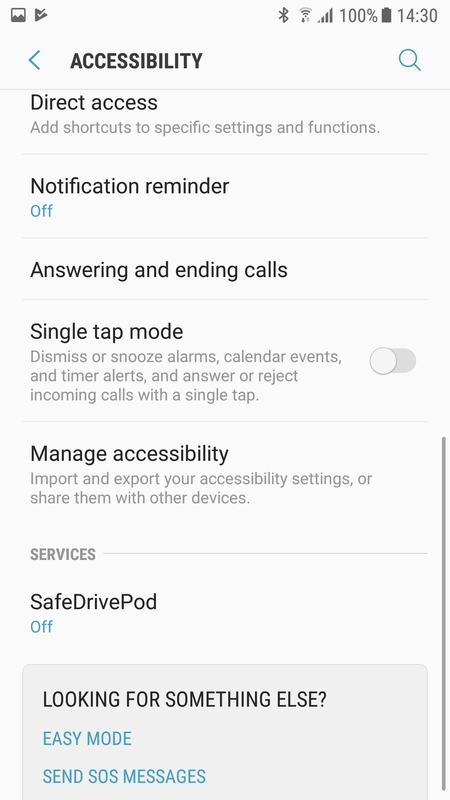 Before you start: turn Bluetooth on, but do NOT go to Android Bluetooth settings to pair the SafeDrivePod. 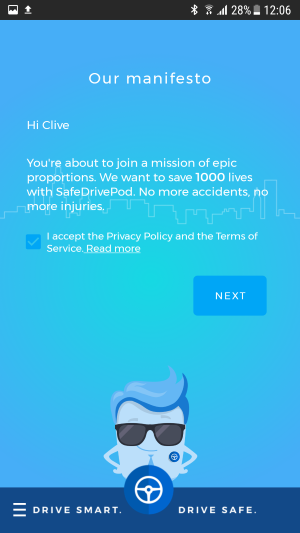 The connection with the SafeDrivePod will be taken care of by the SafeDrivePod app. Visit the Google Play Store and install the app. 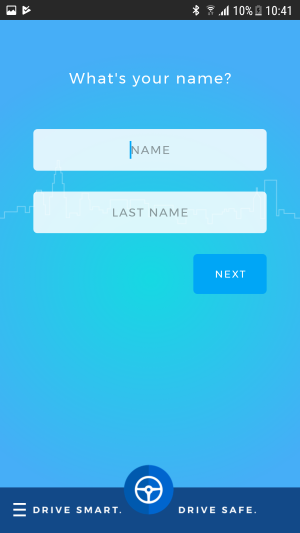 Open the app, press "Sign up" and enter your name and surname. The app will then ask for a contract number. 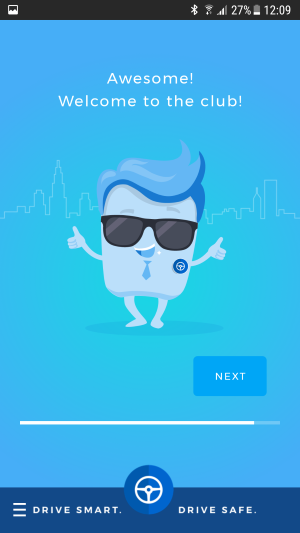 Provide the contract number you received with your SafeDrivePod. Lost your contract number? Ask the person who sent you your SafeDrivePod. Already registered? Log in with your credentials. Proceed by entering your mobile phone number. Make sure the country code is correct. 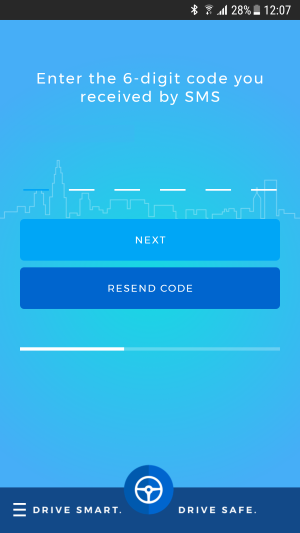 Enter the 6-digit confirmation code you've received by text message and press 'Next'. Create a password longer than 6* characters and enter it in both fields. 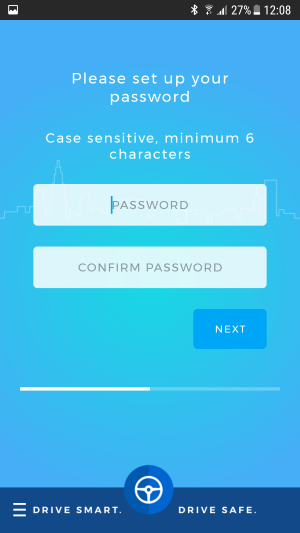 *) If your company has chosen for 'strict passwords', the password has to be at least 8 characters long and must contain at least one letter, number and special character (!@#). Enter your email address and verify it using the link in the mail you've received. When you click the link, our website will load. You don't have to do anything else on this page. Instead you can go back to the app and press the 'Next' button. 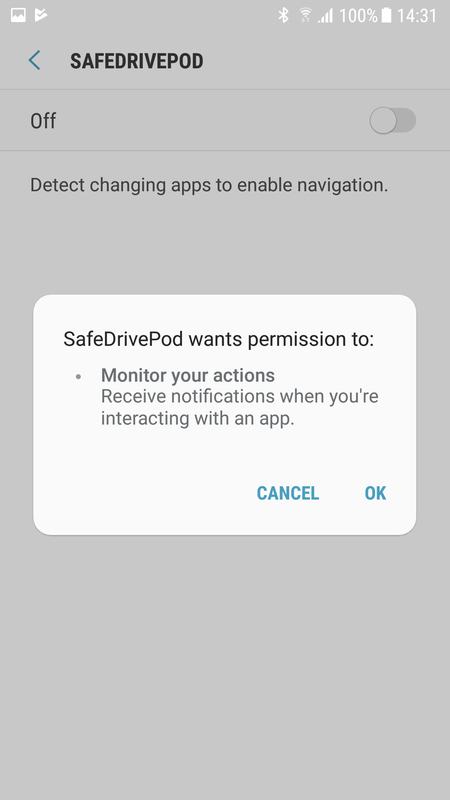 Now the app has to connect to the SafeDrivePod. Make sure bluetooth is on and keep the pod close to your phone. The connection will occasionally fail. If so, try to shake the pod. You should also make sure there are no other pods closeby. Attention: connecting the pod has to go through the SafeDrivePod app, NOT through your phone's bluetooth settings. Wait until the app has found the SafeDrivePod. Shake the pod once more and press 'Next'. 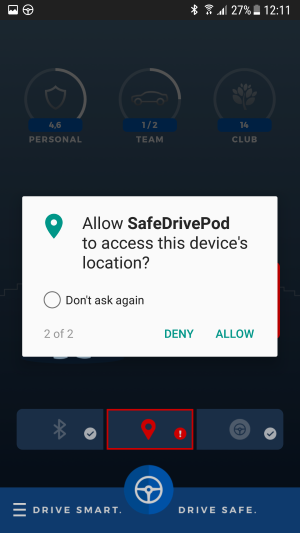 If at this point the Android system requests you to grant the SafeDrivePod app access to your device's location, press 'Allow'. No data about your location is stored in the phone's memory nor is it transferred to the cloud. Read more in our privacy statement. *) If your company has chosen for the 'All pods' option, this step of the installation will be completely omitted. 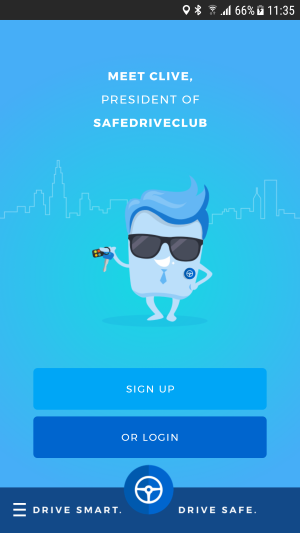 The app will then automatically connect to all SafeDrivePods it finds. This is convenient if you have multiple drivers in multiple vehicles. Attention: It is crucial that you allow the app to access your device's location. 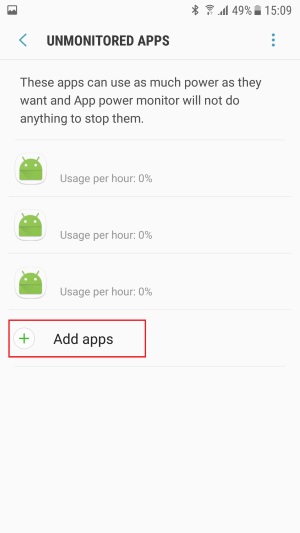 The app now requests you to change your battery usage settings. To do so, press 'Open Battery Settings', tap 'Apps not optimised'* and select 'All apps'. 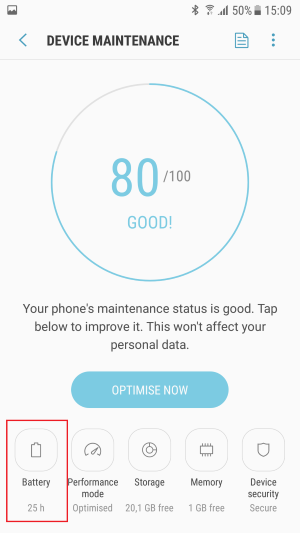 Scroll down to find the SafeDrivePod app and turn its optimisation off. *) Some operating systems will already have 'All apps' selected. It is important that you correctly change your battery settings. Otherwise the app will not function properly. You can now return to the app and press 'Next'. The installation is almost complete, after you press "All done, let's drive! 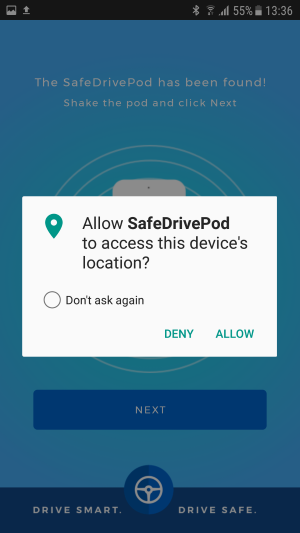 ", the android system will ask you to allow SafeDrivePod to 'make and manage' phone calls and, if it did not do so earlier, to access your device's location. Press 'Allow' on both pop-ups. No data about your location is stored in the phone's memory or in the cloud. Access to your phone calls is only used to detect the start and end of a phone call, in order to enable hands-free calls in your car. Read more in our privacy statement. Lastly, the android system will ask you to grant permission to the SafeDrivePod app to appear on top (of other apps). Turn 'allow permission' on and return to the app. If the app asks you to once again change your battery usage settings, this has to do with your device's 'power manager'. See the next chapter of this manual. 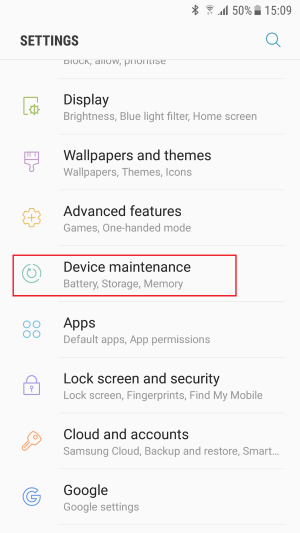 Many Android phones have an active 'power manager' or 'battery manager'. This manager is able to shutdown apps when they are not registered to a white list. 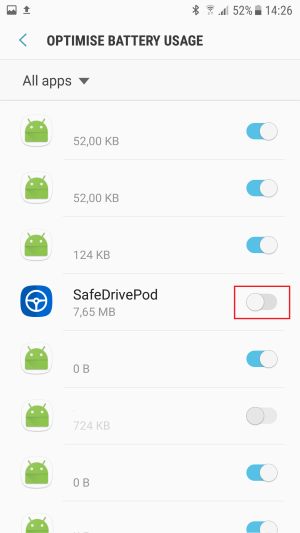 The SafeDrivePod app uses very little power, but is not added to the list by default. Step 4 Select SafeDrivePod from the list and press 'Done'. Step 4 Select 'SafeDrivePod' from the list and make sure it is ON. SafeDrivePod has now been added to the list of protected apps (it will not be stopped by the battery manager). Step 2 Tap the menu icon and select 'Power-saving exceptions'. Step 3 Tap 'APPS' and select SafeDrivePod from the list. 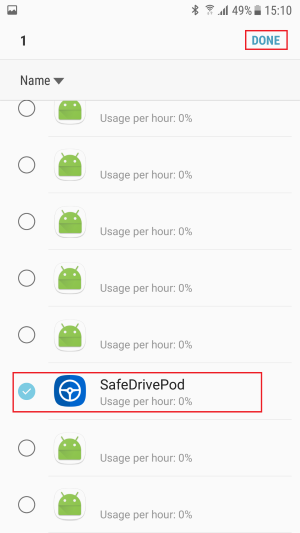 SafeDrivePod has now been added to the list of apps that are exempt from optimisation (it will not be stopped if you switch to 'STAMINA' mode, but it will be if you switch to 'Ultra STAMINA' mode). SafeDrivePod will no longer be closed by the phone. 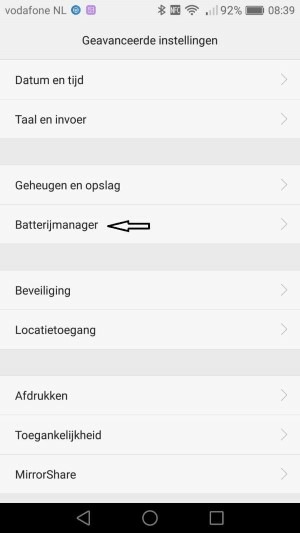 Step 1 Start the 'Auto-start Manager' or start the 'ASUS Mobile Manager' and select 'Auto-start'. 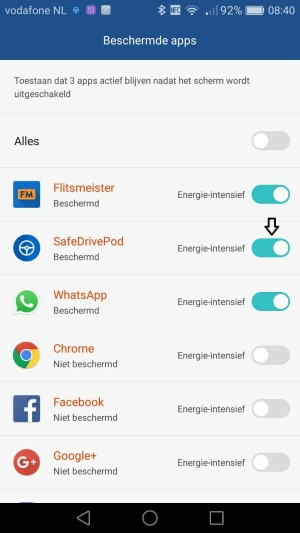 Step 2 Find SafeDrivePod in the list and switch it to 'ALLOW'. 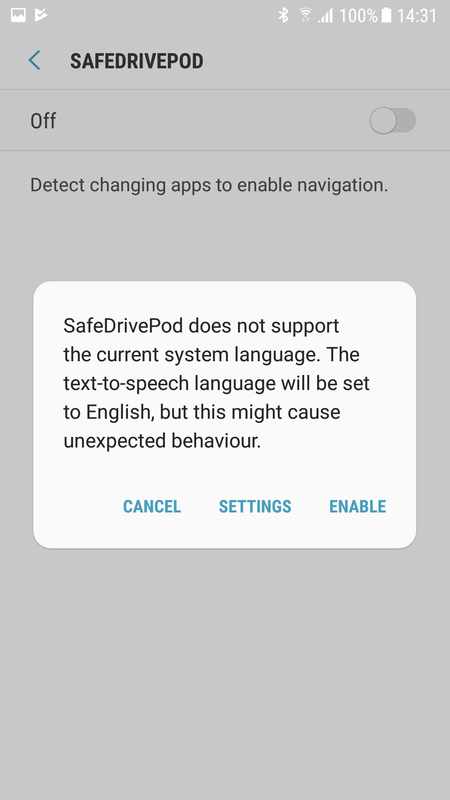 The phone will no longer block the SafeDrivePod app. Step 4 Select 'SafeDrivePod' from the list and turn it ON. 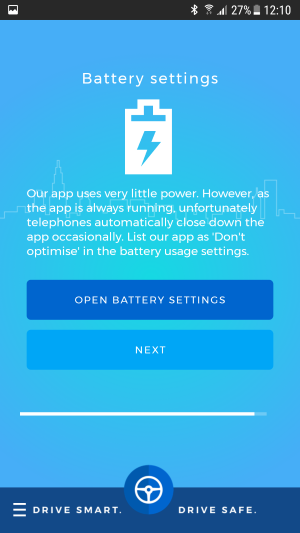 Our app uses very little power. However, as the app is always running, telephones unfortunately automatically close down the app occasionally. 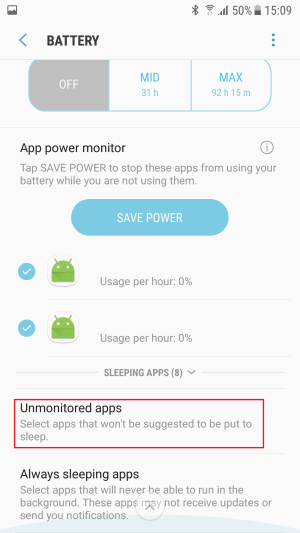 List our app as an exception in the battery settings under 'Power-intensive apps', 'Unmonitored apps' or 'Battery optimization' (depending on the device). If you can not find this setting, please consult your phone's manual. 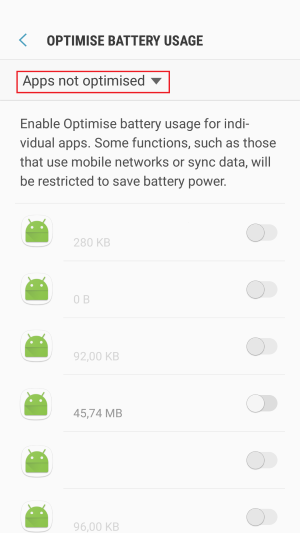 Keep in mind that your phone might not have a power manager besides the default 'power usage optimisation' setting. Step 1 Go to "Settings" and choose "Accessibility". 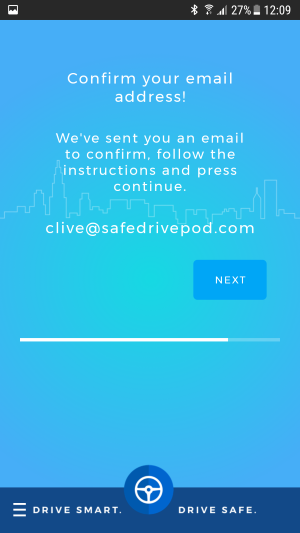 Step 2 Scroll to the bottom, and if SafeDrivePod is set to 'Off', press it. On the next screen, enable the service. Step 3 Select OK and enter your pin/pattern if asked. Step 4 Select enable if there is a language notification. Some Android phones (mostly Samsung and Huawei), have a Secure Startup function. Step 5 Go to settings and select "Security" or "Lock screen and security". If a notification is shown to update the settings, choose "UPDATE". Step 1 Place or stick-down the SafeDrivePod somewhere in the car's interior cabin. It does not need to be visible. With relation to warmth, avoid placing it near the car’s windows. Step 2 You are now set-up and ready to go. The app is always running in the background and searching for your SafeDrivePod. 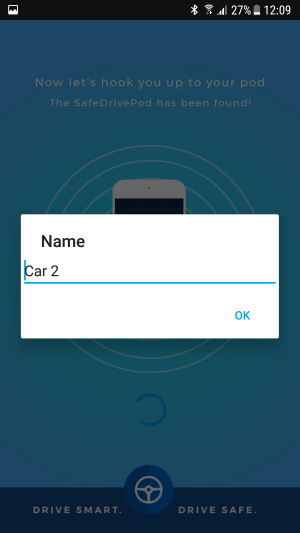 As soon as the app has found it and the car is moving, the pod will detect the vibrations, conclude that you are driving and the app will initialize the ‘lock’ screen. You are then unable to access your telephone. However, Internet still works. You are still able to make and receive hands-free calls, unless this is switched off by your employer. If your car stops, the pod will detect this after a few seconds and pass it on to your telephone. The 'lock' on your telephone is released and you have full access to all functions. Be extra careful with the use of your telephone in the traffic! In an emergency, you can press the SOS button while driving or, if you have stopped before the pod noticed. Default, however, this emergency feature is turned off, because of frequent mis-use. In case this feature is turned on, pressing the SOS button will give you full access to all functions of your phone again. Please note: we monitor the use of the SOS button which is explicitly intended for emergency situations only. Additionally, in order for the app to function correctly, the Bluetooth of the telephone needs to be switched on at all times. If you switch off or uninstall the app, or turn off Bluetooth, this will be automatically recorded. Battery use on modern phones is barely influenced by Bluetooth or location services. If you choose not to enable this option. You'll have to click on the navigation button every time before you start driving. You'll find the navigation button in the SafeDrivePod app on the bottom right hand side of the screen. The chosen navigation app will then start automatically, you can enter the destination of your journey and the navigation will then begin to calculate your car journey. When you begin to drive, your telephone will lock automatically, however, the navigation app remains visible. 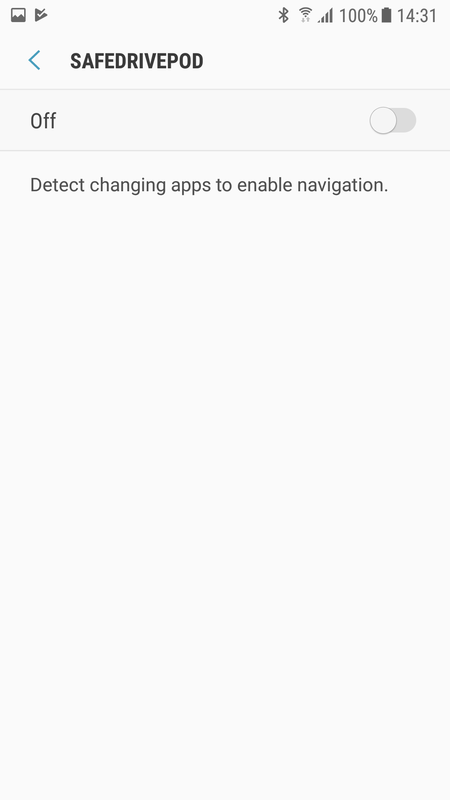 If you try to leave the navigation app by clicking on the home button, the telephone will automatically go back to the SafeDrivePod app and will return to the navigation app within a few seconds. By default, the GPS function of your telephone is not used because the pod itself detects whether you are driving or not. In the odd case that you have a SafeDrivePod that does require GPS, the app will ask you to allow location services. GPS from the telephone will then be used to measure whether you as a driver of the car are actually driving. Therefore, it is important that your telephone has GPS switched on if the app asks this of you. For Android: go to Location settings and switch on. 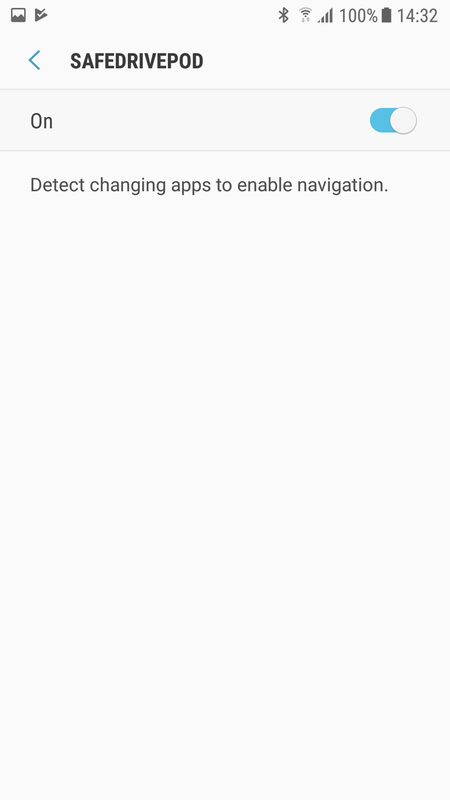 If you want to prevent other apps from using the location services, you can do that in the individual set up from each app via Android settings. SafeDrivePod does not store location details. Your family members can use the SafeDrivePod in the same way (so multiple users per SafeDrivePod is possible). If you wish to have an additional SafeDrivePod for your second vehicle, please send a message to info@safedrivepod.com. If you make changes to your vehicle type, for example, changing your lease car or temporarily changing your vehicle (rental or company pool car), please do not forget to take your SafeDrivePod with you! The SafeDrivePod has a 4 year lifespan. Before you start: turn Bluetooth on, but do NOT go to iOS Bluetooth settings to pair the SafeDrivePod. 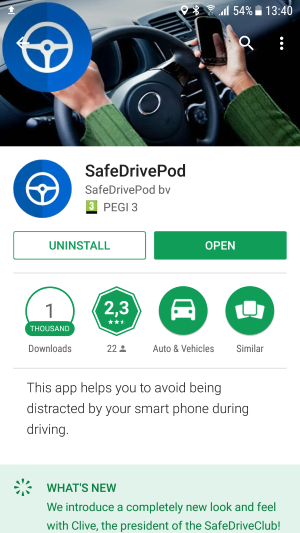 The connection with the SafeDrivePod will be taken care of by the SafeDrivePod app. Go to the Apple App Store, install the app and open it. The iOS operating system immediately asks you to allow the app to send you notifications. Press 'Allow'. Now press 'Sign up' to start. It is important that you select 'Allow', else the app will not function properly. Enter your name and surname. The app will then ask for a contract number. 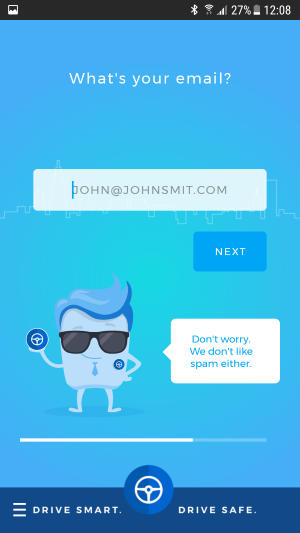 Provide the contract number you received with your SafeDrivePod. Lost your contract number? Ask the person who sent you your SafeDrivePod. *) If your company has chosen for the 'All pods' option, this step of the installation will be completely omitted. 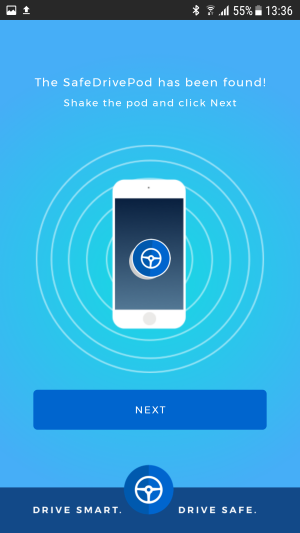 The app will then automatically connect to all SafeDrivePods it finds. This is convenient if you have multiple drivers in multiple vehicles. Please note: when you enter a new vehicle, make sure the app runs in the foreground (click the SafeDrivePod app icon): you will then see the 'Bluetooth Pairing Request'. 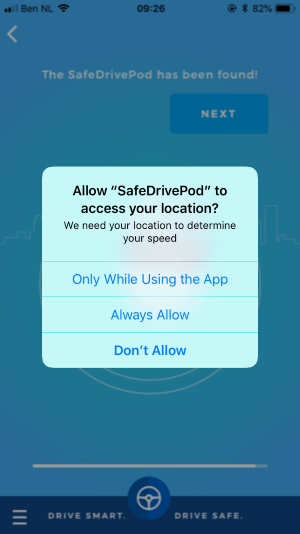 If at this point iOS requests you to allow the SafeDrivePod app to access your device's location, press 'Always allow'. No data about your location is stored in the phone's memory nor is it transferred to the cloud. Read more in our privacy statement. 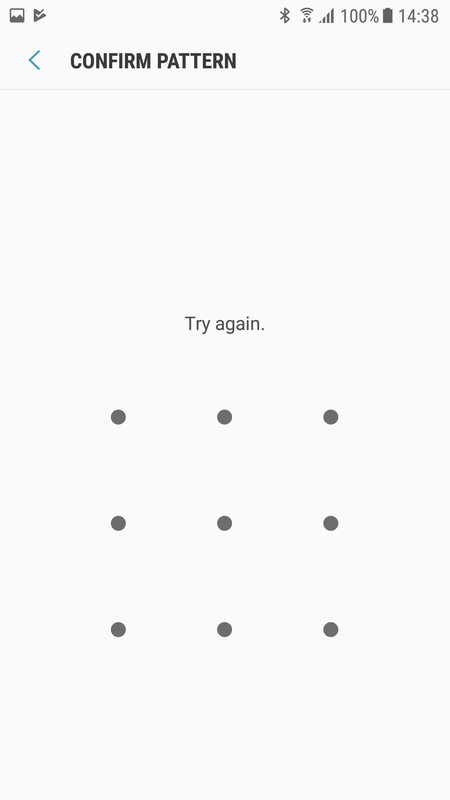 Now press 'Pair' to finish connecting the pod to the app. 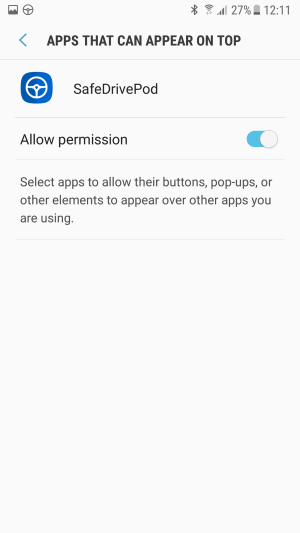 Attention: It is crucial that you press 'Always allow' when the app requests access to the location. 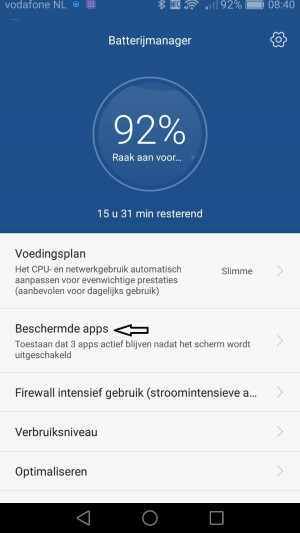 The app now displays important information about the battery usage of our app. Read this carefully. This information can also be found in the 'Battery Use' section of this manual. Now press 'Next' and then "All done, let's drive" to finish the installation. In an emergency, you can press the SOS notification while driving or, if you have stopped before the pod noticed. Default, however, this emergency feature is turned off, because of frequent mis-use. On the lock screen of your iPhone you will see a notification with the message that you can swipe to the right to unlock your phone. 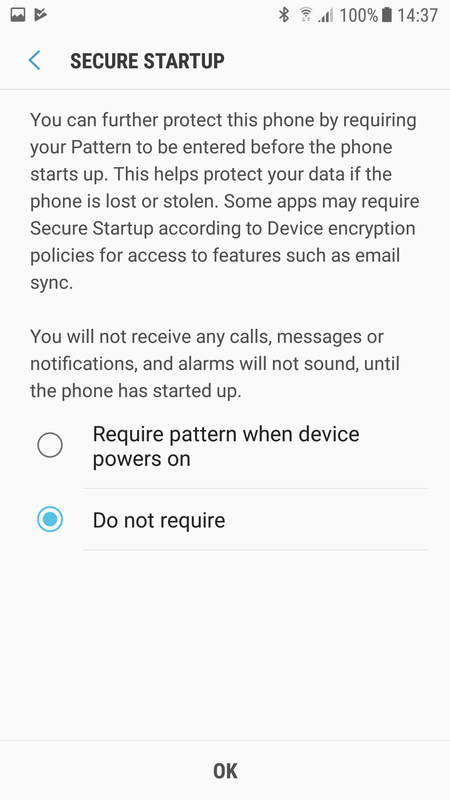 In case this feature is turned on, pressing or swiping the SOS notification will give you full access to all functions of your phone again. Please note: we monitor the use of the SOS notification which is explicitly intended for emergency situations only. Battery use on modern phones is barely influenced by Bluetooth or location services. However, in case an app uses these functions, this obviously consumes power. When you are not in your car: the app cannot find a SafeDrivePod and will go to low power mode. It will not consume any power. Please note: to make this work, the app has to run in the background. 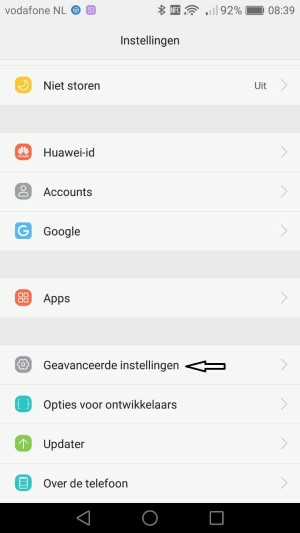 Do not swipe away the app (so that you cannot find it back in the list of running apps when you double click the home button), because the app will still continue to function, but will use GPS to keep running. This will consume power! So for optimal battery performance: please keep the app running in the background at all times. 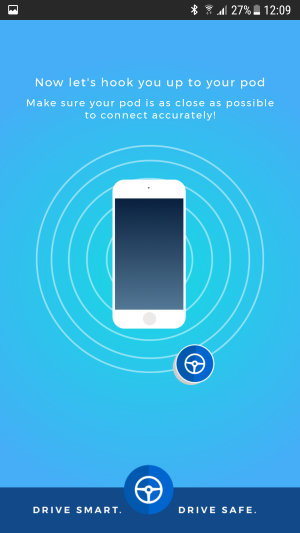 When you are in your car: the app will find a SafeDrivePod and is activated. GPS will also switch on to measure your speed. Now, the app consumes power. In case you spend a lot of time in your car, taking an in-car charger with you is recommended. However, if you own the GPS-free version of SafeDrivePod, GPS will not switch on and therefore will not consume additional power. If you want to use navigation while driving, you can use Apple Maps. If you want to use a music app, like Spotify, while driving, make sure to start it before you start driving. The Bluetooth connection that streams the music to your car will continue to work while driving. In order to monitor whether you are actually driving the vehicle, we use the phone's GPS. Therefore, it is important that your telephone has GPS switched on. For iOS: go to Location settings and switch on. 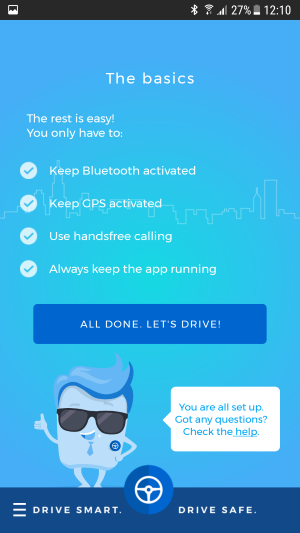 The GPS-free version of SafeDrivePod does not require you to have your GPS switched on. However, since it does not use your phone's GPS, it does not consume your phone's power, therefore there is no harm keeping your GPS on regardless. If you want to prohibit other apps from using the location services, you can do that in the individual set up from each app via iOS settings. 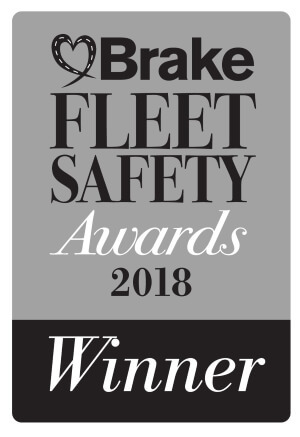 We wish you a safe driving experience!